Those who remember the print version of TechNet Magazine will recall the giant posters you’d sometimes get showing the architecture of various products such as Windows Server, SQL, and Exchange. When the print version of TechNet was stopped, many thought we’d seen the end of these valuable tools. Well, that’s not the case. The Exchange product group has released the Exchange 2010 Architecture poster. This downloadable .pdf file is in the same format as the print versions, and it’s huge. A wealth of information is contained on it. Now, to find a printer that can handle it! 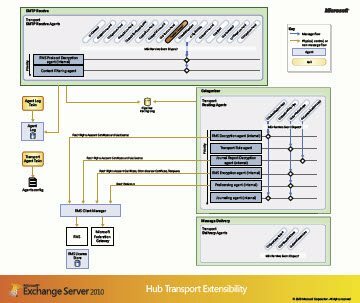 Also, the product group released released the Exchange 2010 Transport Architecture Diagrams. 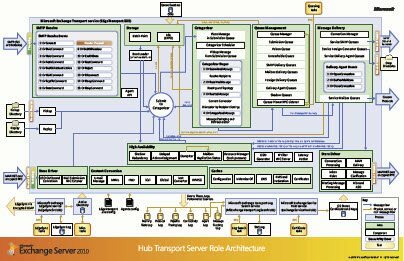 The two diagrams available there cover Hub Transport Role Architecture and Hub Transport Extensibility. If you’re looking for the 2007 poster, it can be found at Exchange Server 2007 Component Architecture. If you’re running Exchange Server 2010 SP1, you need to apply Update Rollup 1 for Exchange 2010 to address the issues listed below. Microsoft also announced that UR2 for Exchange 2010 SP1 should be released in early December. This is the changelog page for New-HandBrakeConversion.ps1. You will find a complete list of released versions, their dates, and the features and issues addressed in each. Please refer to the script’s main page for more information including download links, installation details, and more.